I loved the Marshmallow Indian Corn craft idea from No Time for Flashcards, but didn't have any marshmallows. I also wanted the boys I was doing this project with to be motivated to do it... and they love Cap'n Crunch. It was quick and a lot of fun and they loved snacking on the non-gluey Cap'n Crunch as they worked. Materials Needed: yellow cardstock, large brown paper bags, black sharpie, brown pom poms (the boys love these as well), Cap'n Crunch cereal, scissors, and Elmers glue. Prep ahead- draw corn shape (yellow) and husk (brown bag) onto paper/brown bag. 1. Put the cereal in bowls that are easily accessible for the kids. 2. Put glue dots or glue squiggles on their corn and have them start sticking Cap'n Crunch onto the glue. Remind them not to eat any piece that has touched glue... but they can snack on the ones that are in the bowl while they work! 3. Cut out the husk and tape or glue it onto the yellow paper. I didn't cut out the corn all the way because the Cap'n Crunch is pretty heavy. 4. Let the corn dry. 5. Add some more glue to the husk and decorate it with pom poms, pieces of straw, or any other textured objects you would like to use... or that are motivating to your little ones. If we hadn't just eaten so much candy this weekend, I might've even used chocolate chips. 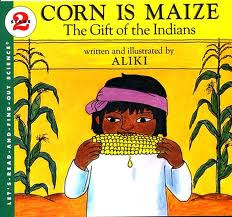 Corn is Maize by Aliki is a great book to use along with this craft. There are great descriptions and pictures about corn and it talks about all the different things you can make with corn! With my 2nd graders we used to make cute corn fact books (shaped like corn) using all the information we discovered in this book! If you have more time that we did, you could try and make a simpler corn fact book with your little one and you could transcribe the information that they pass along as you read the book together.